Here is my Crochetville bag that I was the proud recipient of from Mary Jo in September 2012. 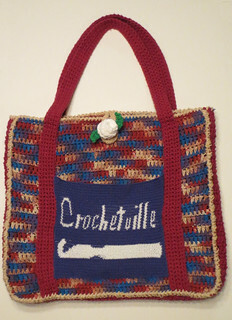 Each month Mary Jo aka Tampa Doll makes one of her famous tote bags and gives it to some lucky person on Crochetville. I was so excited when I received my bag. It’s just so cool and such a wonderful gift to receive from another crocheter. One of the things Mary Jo tells you when you receive her bag is that you may want to line it. Because it is crocheted, it does have holes in the tote bag that small items can fall out of. I was being carefully but did have my crochet hook slip out of the bag a few times and figured I had better line my bag. I chose some cotton fabric and measured my bag to begin making my lining. My tote bag is 16 inches wide, 15 inches tall, and 2 inches deep at side. I wanted my lining to be really customized with a crochet hook holder and have pockets to hold patterns. Below I will outline how I lined my Crochetville Bag. I cut one large piece of fabric to make the lining. I am not a seamstress as I have stated in other posts and I make my linings by creating a pocket to insert into my crocheted bags. 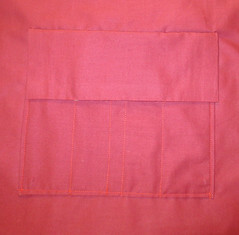 The inside of the pocket is the right side of the lining. 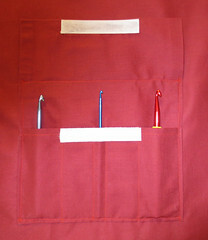 The inside is where the crochet hook holder and pockets are sewn onto. I made my hook holder holder separate before attaching it onto the lining. Below you can see the crochet hook holder I sewed by folding over a long piece of fabric and then sewed a few vertical lines down for the hooks. I added a piece of Velcro for a closures to secure my hooks inside the holder. No more losing my hooks while they are inside my craft bag. Once I had the crochet hook holder done, I machine stitched it on one of my fabric lining panels. I did this before sewing up the side seams as it’s easy when the sides are open. Next I made a pocket with two layers for holding patterns and other items. 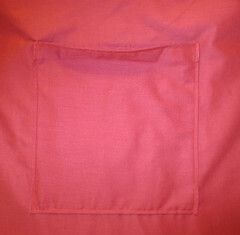 I machine stitched this pocket on the other panel of the lining. I turned under and pressed the top edge to make a hem. I measured to sure that my length was about a half inch longer than my bag and then machine stitched the top edge of the lining. 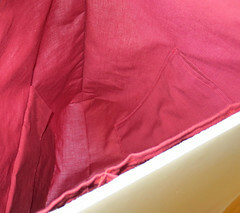 Because I was making box corners on the inside of my lining, I needed to add several inches to the width of my lining. So if your bag is 16 inches wide and the sides are 2 inches deep each, you need the width of your lining to be 20″ wide plus seam allowances for both sides. I cut my lining 21 inches wide and did 1/2 inch seams on both sides of the lining. Now for the box corners, you want to open the end of the seam so you can fold it into a straight triangle. 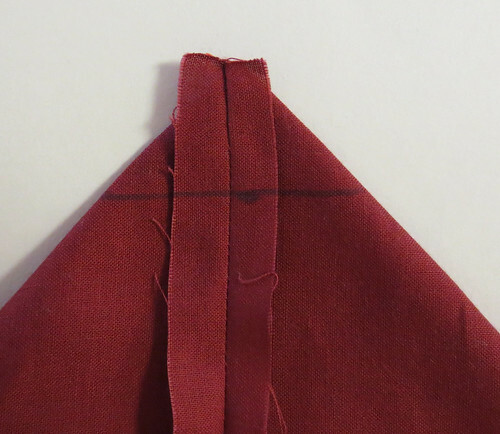 Make sure its straight and that you measure on either side of the seam to make sure it’s even. Because I want a 2 inch deep to my corner in the lining, I measured down 1 inch. Use a ruler and mark your sewing seam so you can sew straight to create a nice square corner in your lining. See the photos below to show the process and result. Turn the right side of the lining to the inside and insert it into the crocheted bag. I hand stitched my lining in place along the top edge going through both layers of the lining and into the crocheted bag. Here is the final lining photo showing the inside of the bag. 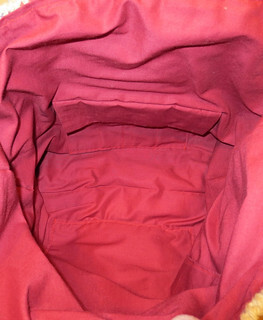 It is difficult to photography the inside of my lining as I need four hands but I hope you can see it turned out great. I love it and it’s like a dream crafting bag now. I have pockets for patterns to be stored and my scissors. Then there is the crochet hook holder which is my favorite part of my Crochetville bag now. I’m just so in love with my bag and can’t wait to start using it for my to-go crocheting bag now.